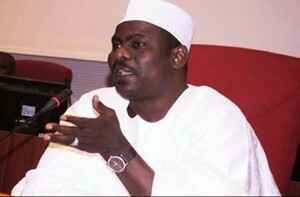 Sen. Ali Ndume (APC-Borno South) has confirmed the rescue of about 1000 women and children by the military in the North East. Ndume disclosed this while speaking with newsmen on Wednesday in Abuja. He said the women and children were rescued from villages occupied by the Boko Haram insurgents in the North East, particularly in Borno State. “Its not stage managed. See, what happened actually, we have so many villages scattered around Sambisa and the villages that are in Gworza. “So, most of these villages, they ran and left behind their wives and little children thinking that the activity of insurgents is very temporary, that they will run somewhere, hide and come back to their families. “Unfortunately, we did not see the end of it getting to a year now and as a result they exhausted their food, they cannot move. “So, they were staying at the mercy of Boko Haram that were occupying those places; now when the military moved in to these places, they only met these girls and small children and very elderly people. “And when the military took over those places, because there’s no food, no shelter, no water supplies, the best thing was for the military to rescue them, take them to rehabilitation centre or the IDP camps where they will be given medical attention. “Where they will be given necessary nutritional foods that they will need and then where they will be able find their relatives and reunite with them”. The senator expressed optimism that the activities of Boko Haram would soon become a thing of the past. “We are very hopeful that sooner than later, that the issue of Boko Haram we will put it behind and concentrate on reconstruction and rehabilitation and even reconciliation. “What is remaining virtually is cleaning up the Sambisa base of the Boko Haram and then cleaning up the roads, access roads going to various villages that I understand have been polluted with Land Mines. “Most of the towns have been completely destroyed. My house has been burnt down completely”.